Congratulations to Gary B. Reid, author of The Music of the Stanley Brothers, who was named Bluegrass Print/Media Person of the Year by the International Bluegrass Music Association (IBMA). Gary Reid was awarded a luncheon on October 1, 2015, in Raleigh, NC, during the World of Bluegrass Conference. 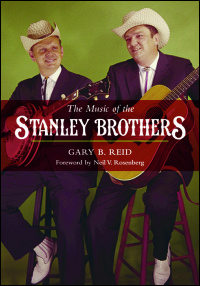 The Music of the Stanley Brothers augments Reid’s vast knowledge of their music with interviews, documents ranging from books to folios sold by the brothers at shows, and the words of Ralph Stanley, former band members, guest musicians, session producers, songwriters, and bluegrass experts.